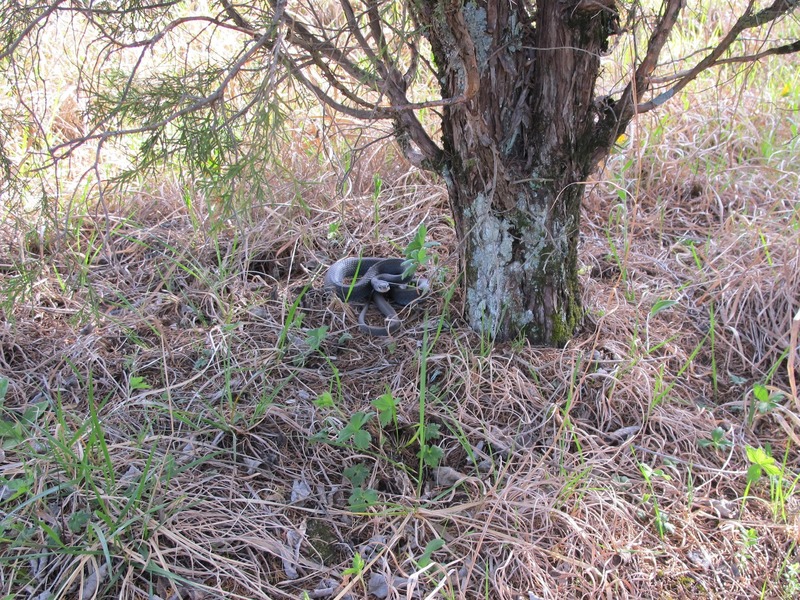 I remember my surprise at finding blueberries growing on dry, high pH, limestone based soils. I had always thought of them as plants requiring wet, acid soils in which to grow. 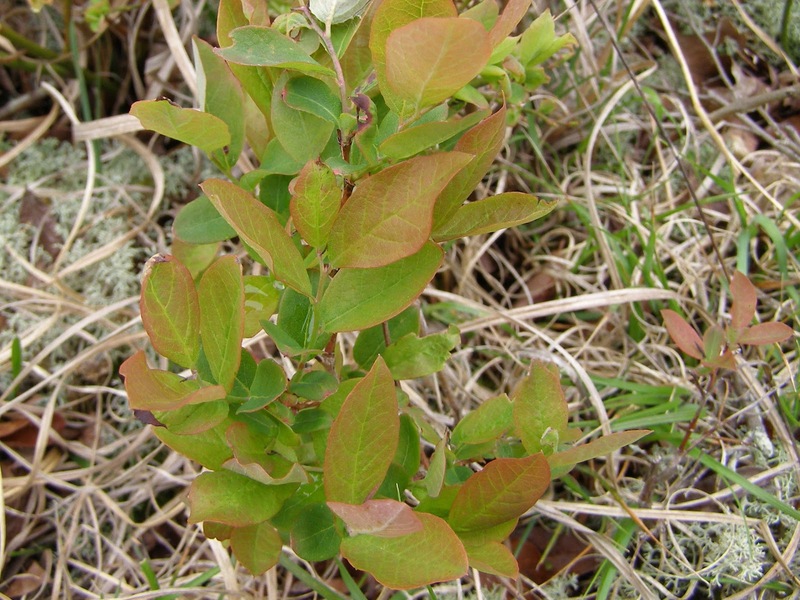 I walked past these plants several times thinking that they were just short Deerberry, which I had already identified on the site. The shock came one day when I glanced down and observed the blooms. 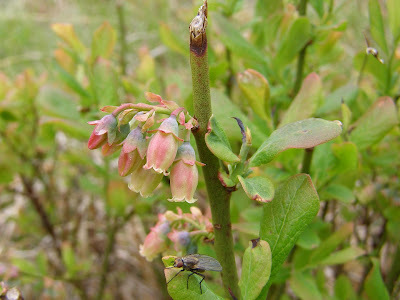 I was looking at Late Low Blueberry, Vaccinium pallidum. Low in the name refers to height, which is seldom more than 18 inches. 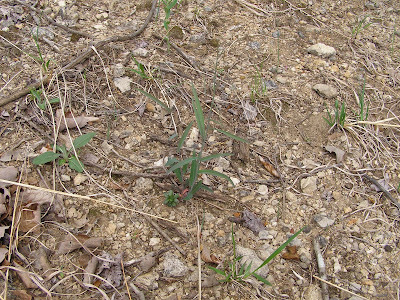 The short plants form colonies that can sometimes spread over a large area. 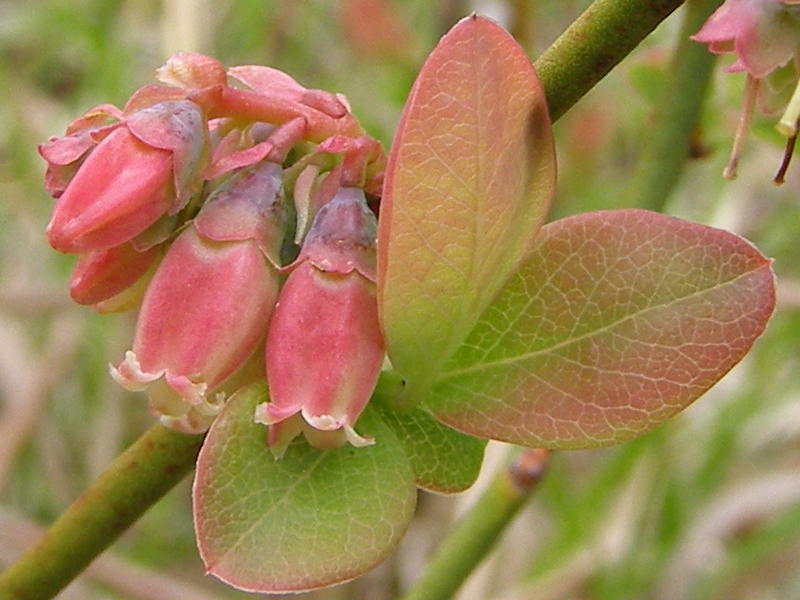 The plants are fairly open and despite displaying various shades of red and pink, are not very noticeable. 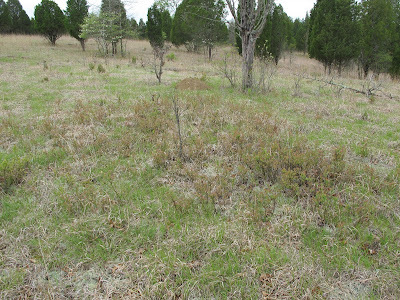 Many clumps virtually disappear later in the summer when overtopped by tall grasses. 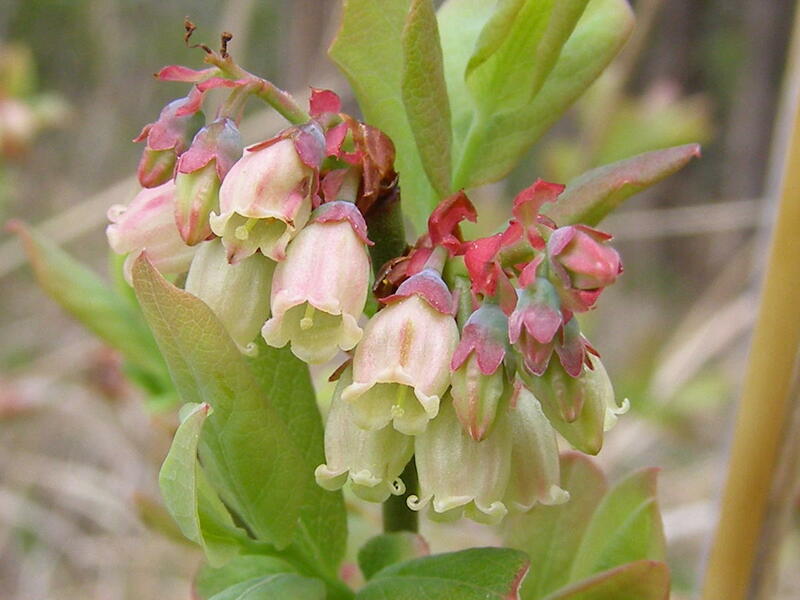 Blueberry species can show a lot of variation within a population. These plants are no exception. 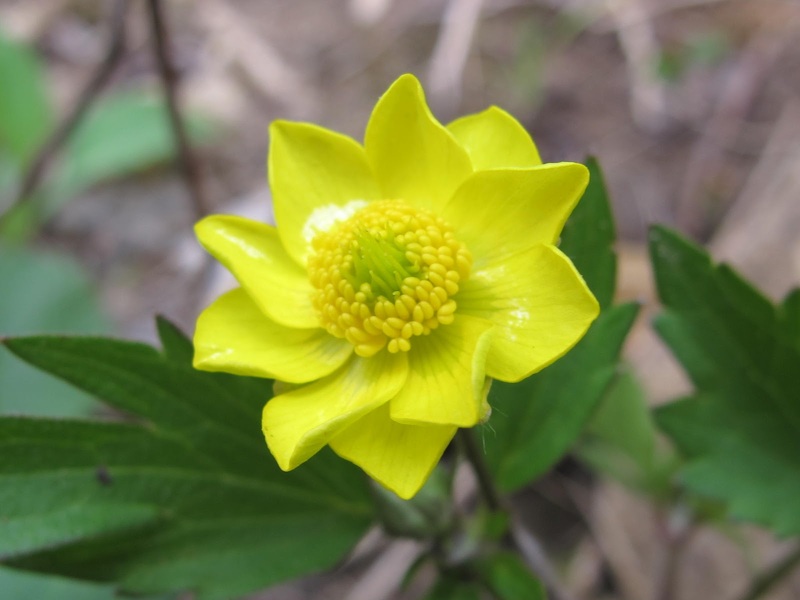 Flower color ranges from a greenish ivory to bright red. Leaves also show a range of shapes. Gleason and Cronquist have combined a couple of species into Vaccinium pallidum, so traits that other people have used to separate species are just some of this plant’s variations. I like the slightly smaller leaves with the pink blush. I think this would be a fine plant to enhance the landscaping around the house. Late Low Blueberry has its fair share of animal interactions. Deer help keep the plant short by constantly pruning the top growth. The fly may have been just perching, but I’ve noticed that some insects have certain plant species upon which they prefer to sit. 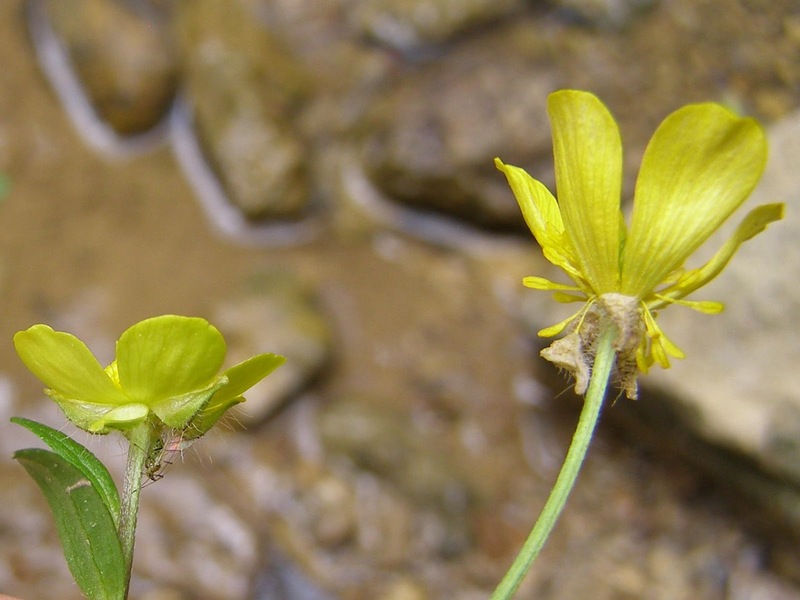 That could mean that the plant plays some important role in the insect’s life. 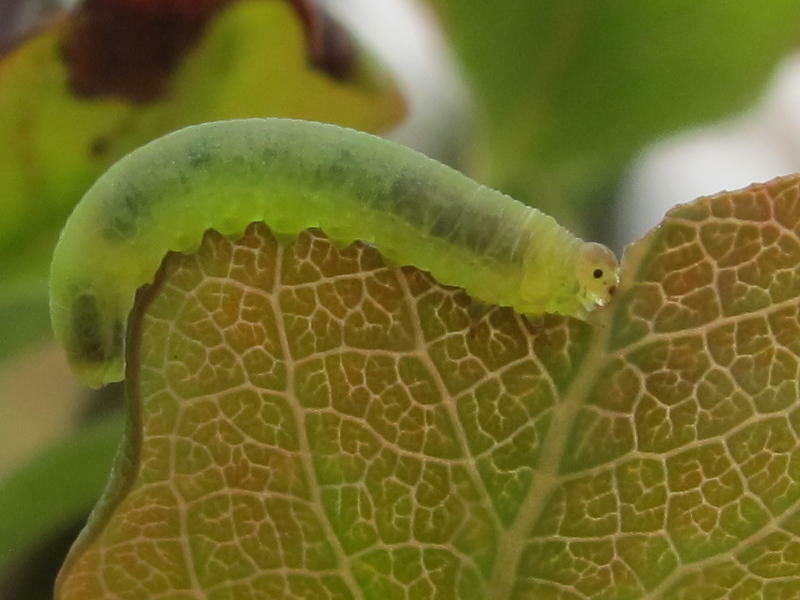 A larva was busily consuming one of the leaves. I took this shot on a cloudy day, but the green of the larva seemed to glow with an inner light. I wondered what it was to become and all I could think of was bird food. Of course, the Allegheny Mound Ants were interacting with the blueberry. 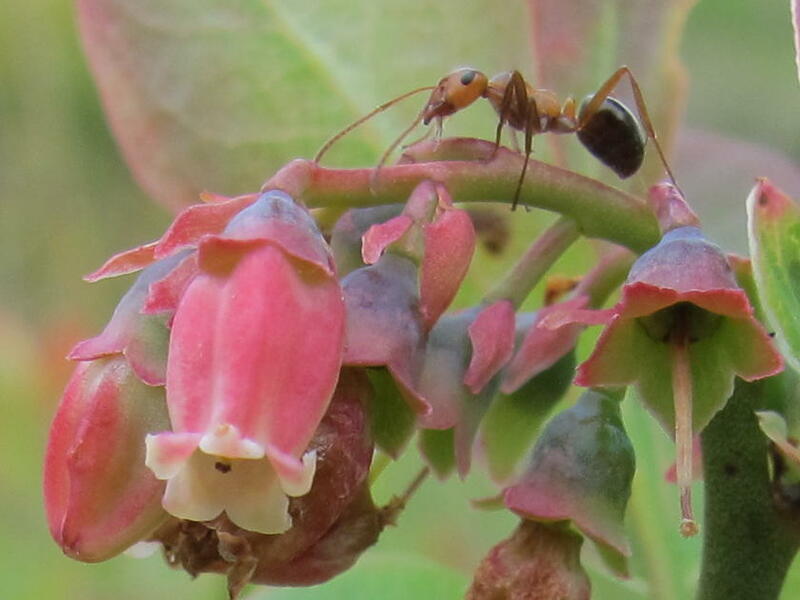 This ant was examining every part of the plant. I wasn’t able to determine what the attraction was. It looks like we might get a good crop of berries this year and I’m interested in seeing how the ants respond to that. 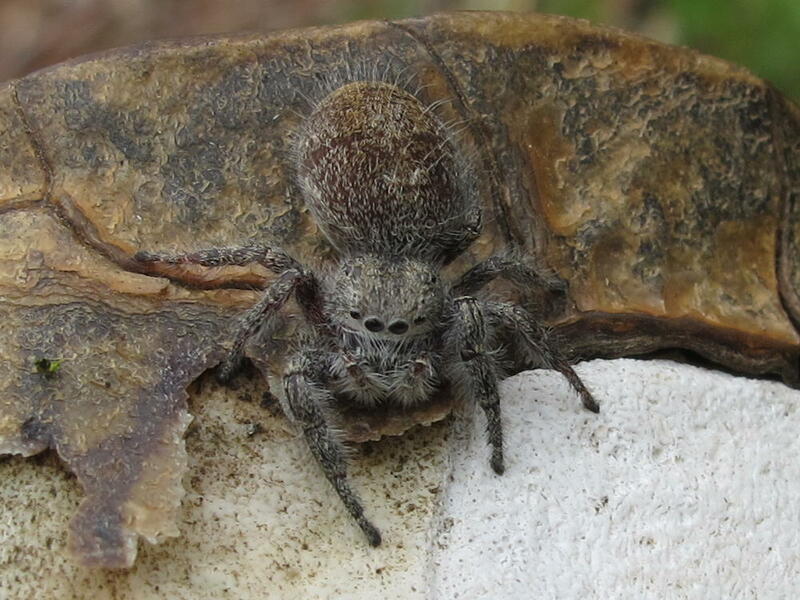 I was lucky yesterday to have a pleasant visit with a cute Jumping Spider. I’m not sure of the species, but I believe it’s some type of Phidippus. 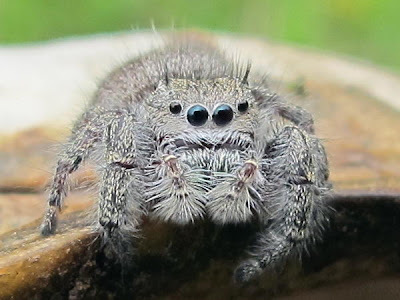 Members of that genus have to be the friendliest and cutest of all the spiders. 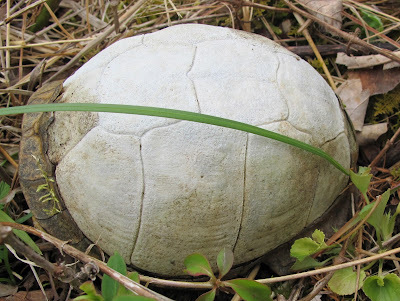 The remains of a turtle shell are what first caught my eye. I was checking to see if there was any physical evidence to the cause of the turtle’s death. 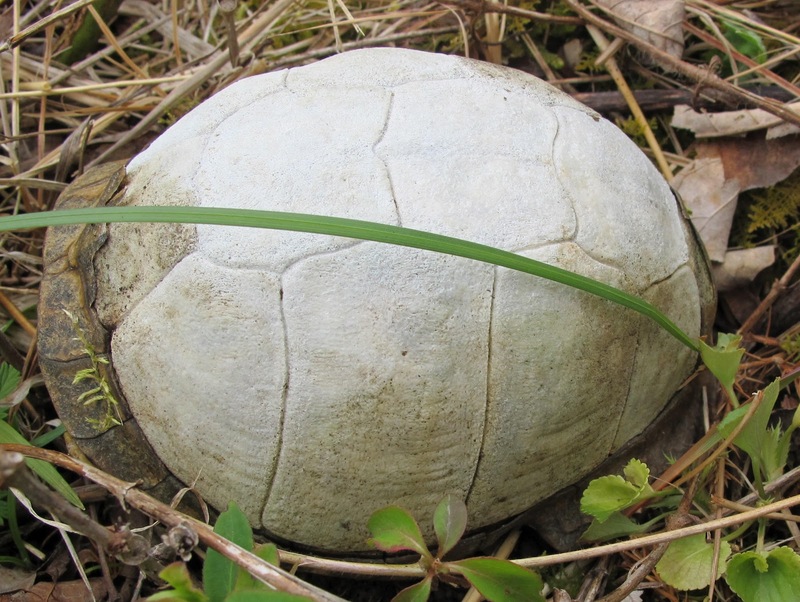 It’s always sad to see that a turtle has died. I just hope that there are enough young turtles coming along to act as replacements. I found the spider hiding beneath the shell. This is certainly a dry and relatively safe place to seek shelter. 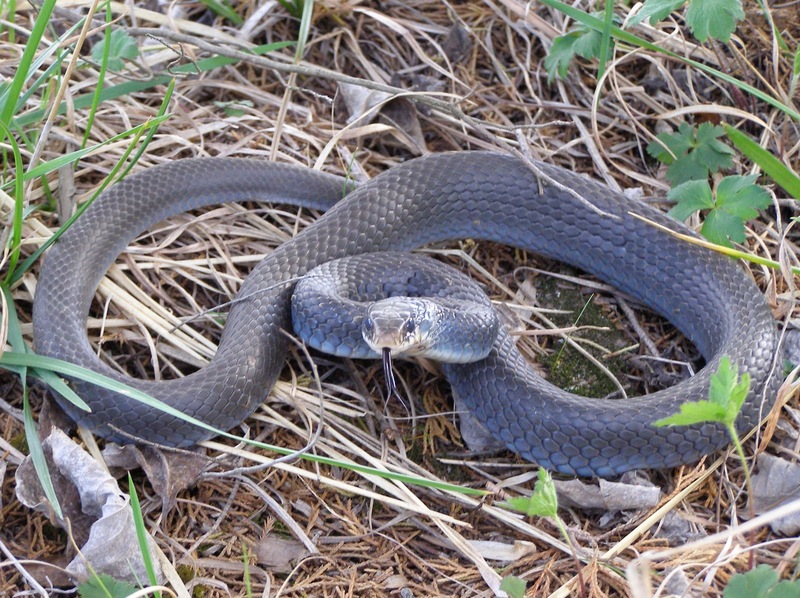 I felt kind of bad about treating its home so rudely. 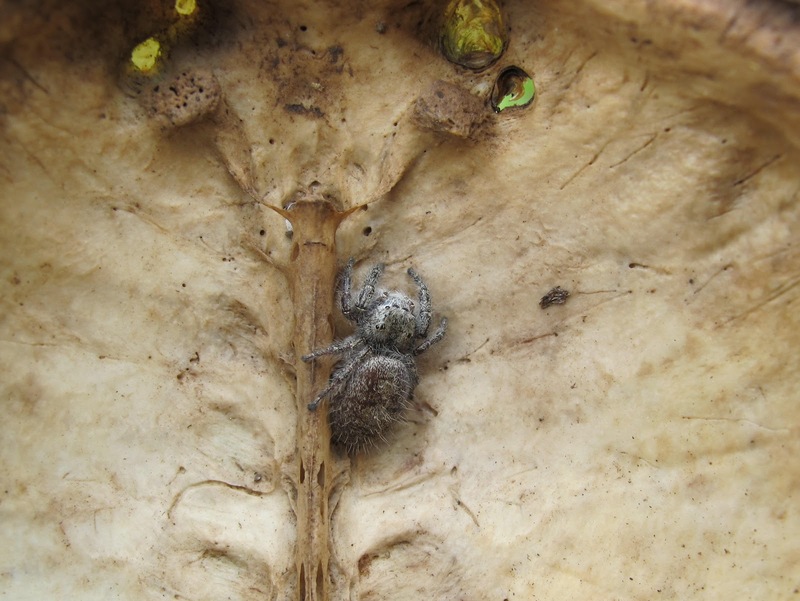 The spider wouldn’t stay still and kept running to the back side of the shell. I was busy trying to rotate the shell with one hand and operate the camera with the other. 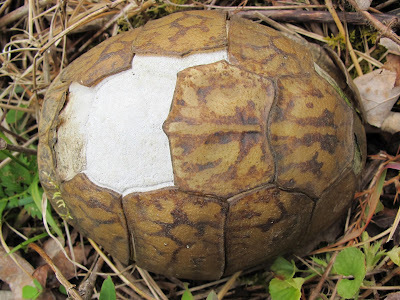 The spider’s colors were a very close match to those of the turtle shell. A fast approaching thunder storm was encouraging me to get back to the house, so I shooed the spider back to the underside of the shell and replaced it as it had been. The scutes were still laying around, so I pieced them back onto the skeleton. There’s enough of the pattern left that I may be able to match it to one of my box turtle mug shots if I happened to take its picture while it was alive. 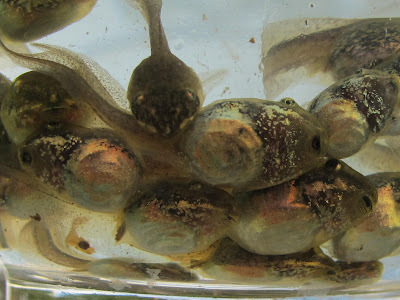 Tadpoles distorted by curved glass. This is a vision right out of my pre-school days. I believed that a jar was wasted if it didn’t contain water and some type of aquatic creature. 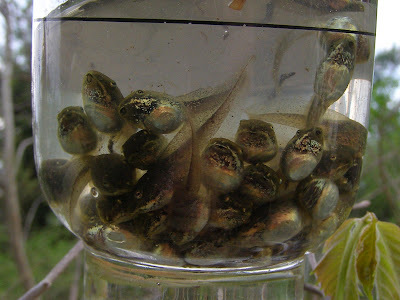 Tadpoles were always one of my favorites. 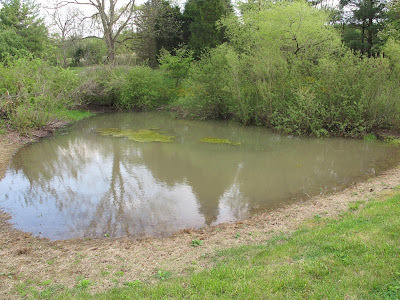 A storm dropped nearly two inches of rain and brought the pond back to life. In just a few hours the pond went from a shallow puddle to this healthy pool. 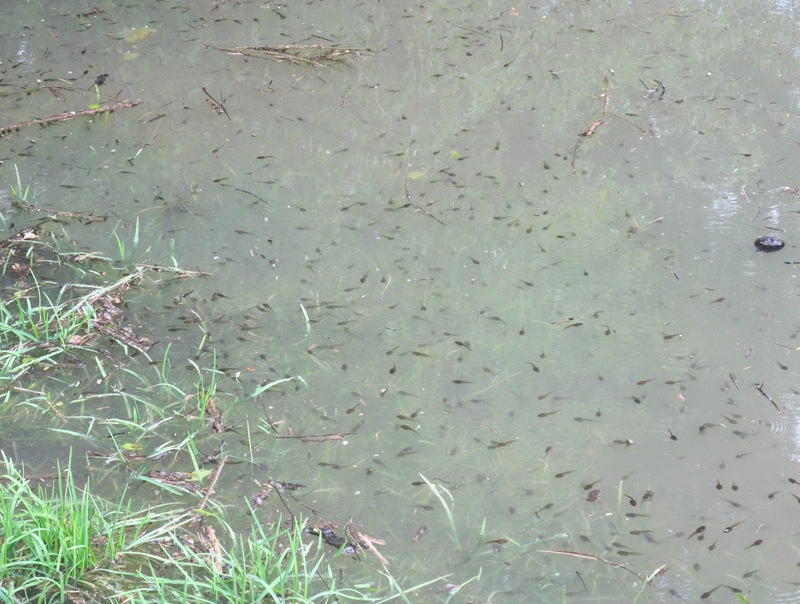 Tadpoles that had been crowded together in the last bit of water were suddenly released to travel the open water. 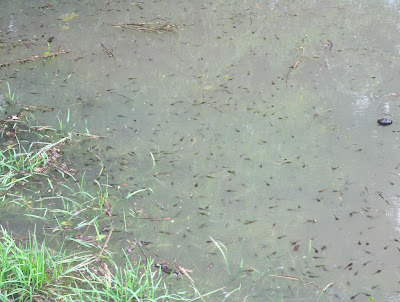 Algae in the puddle made it impossible to estimate the number of tadpoles present, but judging by the masses of tadpoles in the open water, they must have been very tightly packed into the last remnants of the pond water. 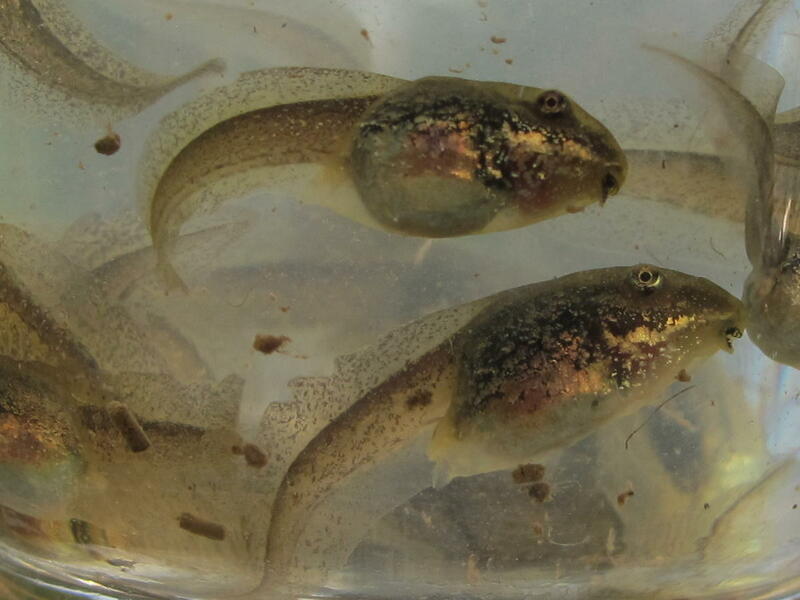 These are Wood Frog tadpoles. They’ve had their problems this season, but it now looks as though they’ll make it to metamorphosis. First the eggs were almost left hanging in the dogwood branches because of high flood water followed by rapidly falling water levels and now they just came within days of having their water disappear completely. 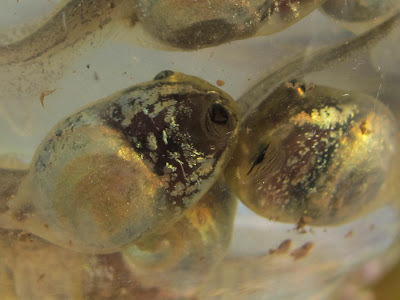 Wood Frogs breed within a short time span, so the entire population of tadpoles grows together with little variation in size of developmental stage. Rows of rasping teeth around the mouth are used to scrape algae and other material from submerged surfaces. An iridescent membrane hides the tadpole’s internal organs, but the spiral of intestines is still clearly visible. As a child, my favorites were species that had a transparent abdomen that allowed clear observation of the working intestines. 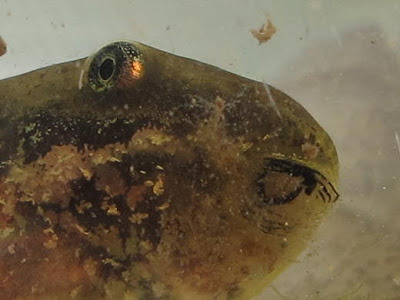 A tadpole’s function is to eat. Material is constantly moving through the intestines and out. These tadpoles were confined for less than two minutes, but they were filling the water with poop. Their nutrient rich droppings sustain new populations of bacteria and algae which the tadpoles then consume. 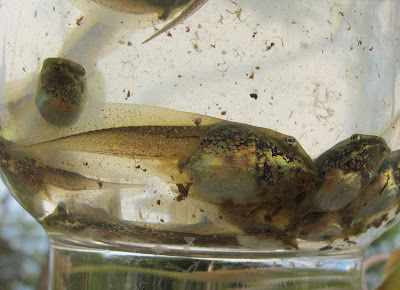 It’s a cycle that helps maintain a diverse population of species in the temporary water body. I’m now looking forward to watching the little froglets leave the water. I was admiring the buttercups growing along the creek and decided to run them through the keys to assure I was calling them by the correct name. I do this with plants that may have caused me some identification problems in the past, just to check myself. My reference sources are greater than they were many years ago and I’m now more practiced at plant identification, so this is my way of confirming my earlier assumptions. 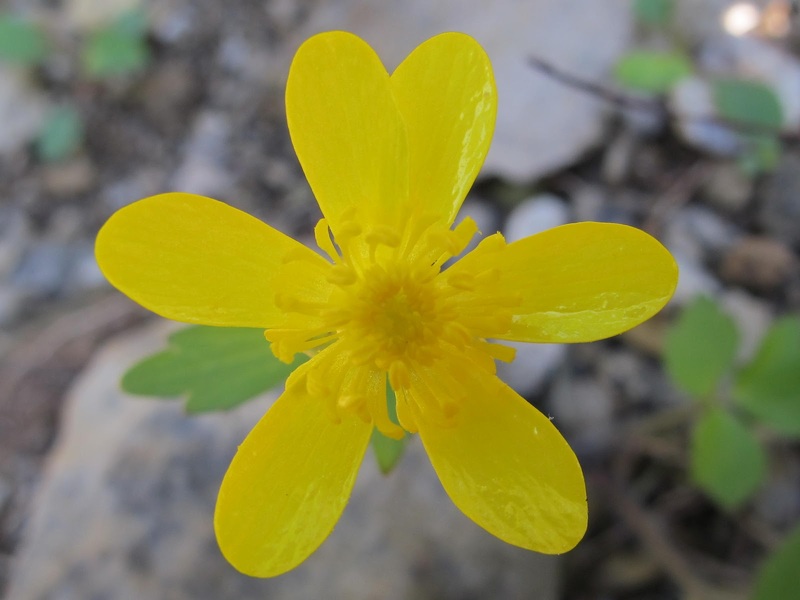 Buttercups are known for their bright yellow color and five shiny petals, so there’s usually no problem in getting that far with the identification. 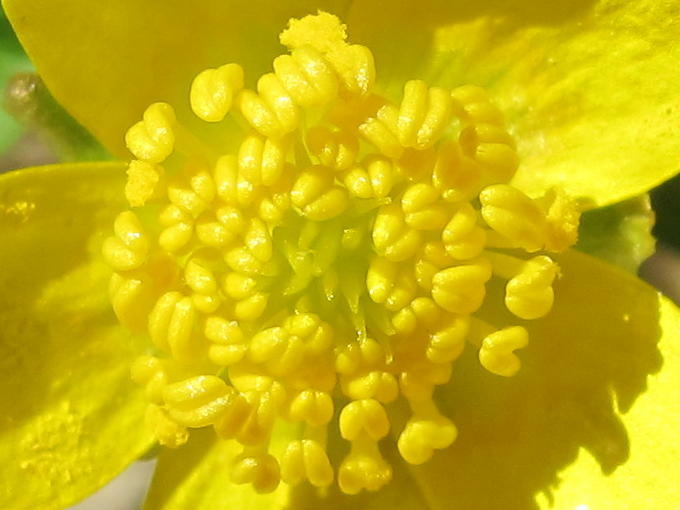 This is Hispid Buttercup, Ranunculus hispidus var. hispidus. At least that’s what it’s called by Gleason & Cronquist in their 1991 manual. G & C combined several recognized species into the single species hispidus and then broke that into three varieties. The combination is supported by some and opposed by others, making it possible to have some heated discussions about this plant’s proper identification. Lumped or split doesn’t make any difference to me. 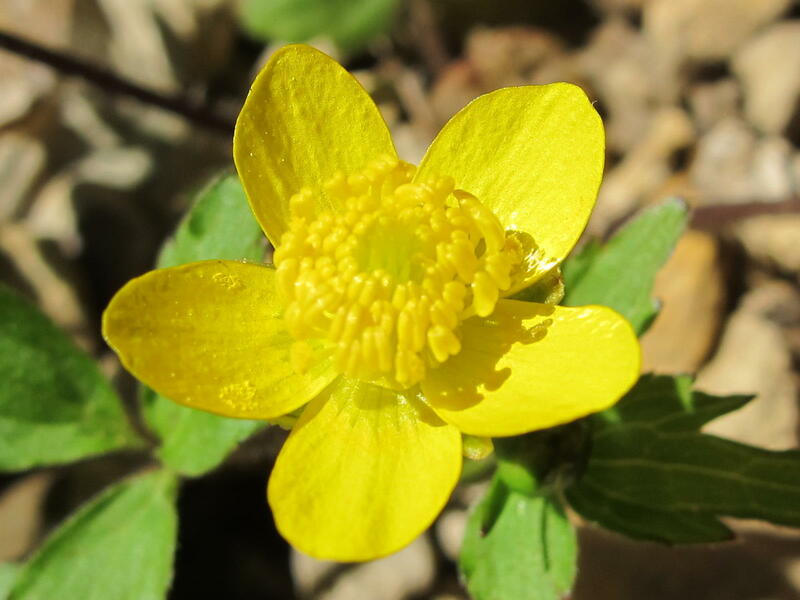 I use G & C because it was used in the preparation of the County Flora List and using the same reference makes it easier for me to compare my discoveries with existing county records. Hispid refers to the presence of short, stiff hairs. There is certainly no shortage of hairs on this plant. It’s interesting that G & C does not make any mention of hairs when it describes this species. Sometimes the plant descriptions have you diving into tiny reproductive parts of the flower. G & C uses the shape of the fruit as a dividing character between two of the varieties. This is something that used to confuse me, because I didn’t know how to determine fruit characteristics when all I had to look at was a new bloom. In some flowers, the shape of the mature fruit is already represented by the female flower parts. 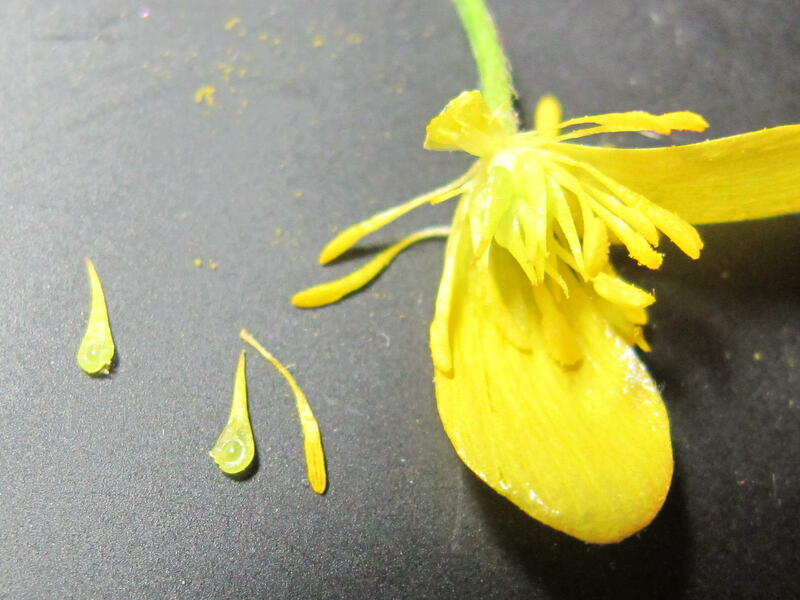 A little quick dissection can easily expose the parts you need to see. The two awl-shaped bits to the left give a good idea of what the mature fruit will look like. Sometimes the plants don’t match any of the descriptions. One of the differences between variety hispidus and variety nitidus, the Swamp Buttercup, is the repose of the sepals, those parts just below the petals. 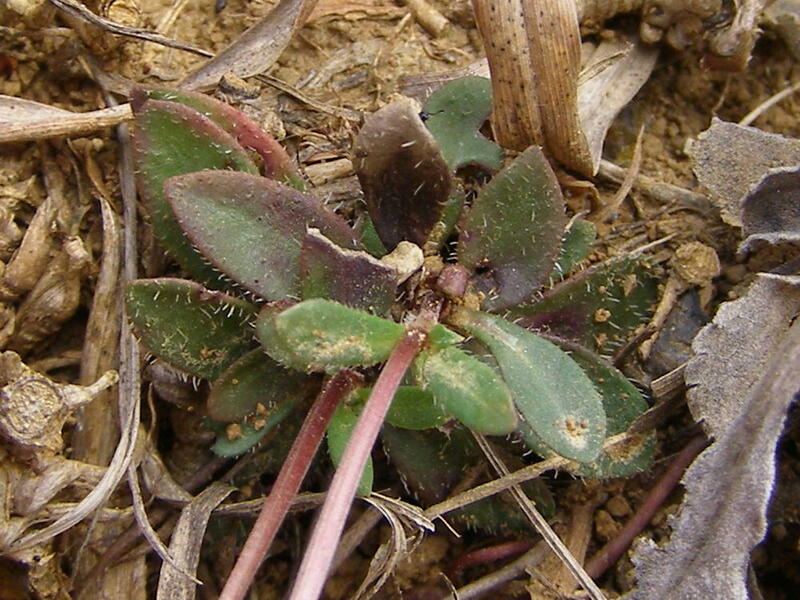 The sepals are supposed to project outward in variety hispidus and hang down along the stalk in variety nitidus. 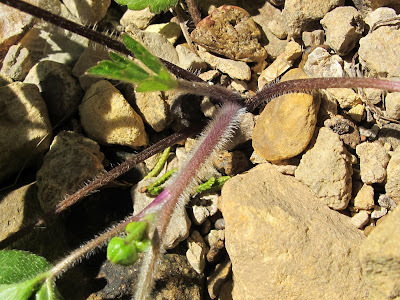 In my plants, the sepals project outward in young blooms like that one to the left. 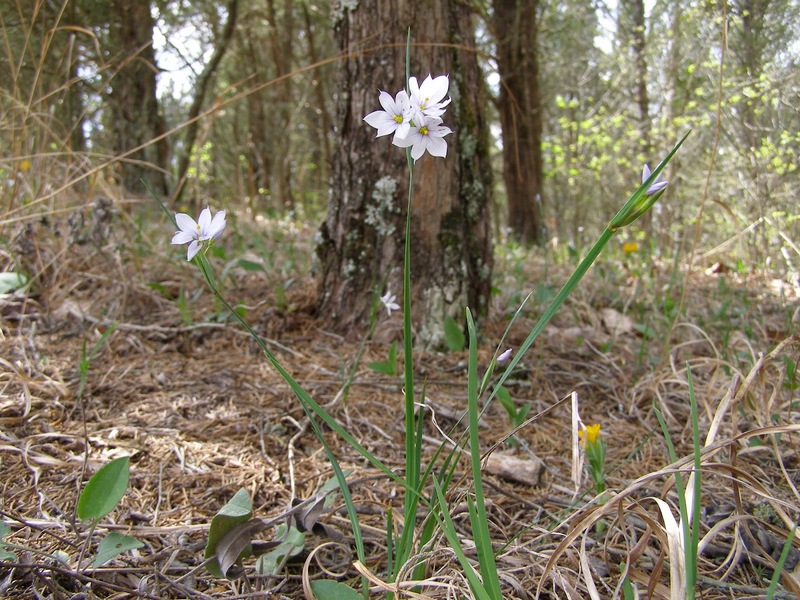 As the flowers age, the sepals begin to whither, then drop down and then drop off. 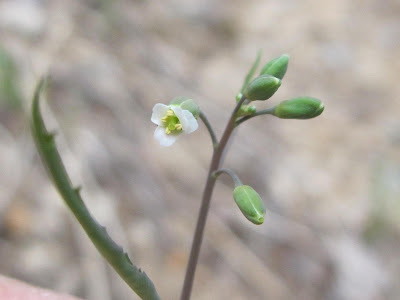 A lot of the flowers appeared fresh when viewed from the top, but a look beneath showed a lack of sepals. Fortunately this isn’t the only character available to divide these two varieties. Variety hispidus displays a fibrous rooting system with no rhizome formation and no rooting at the nodes of sprawling stems. I’ve been watching these plants for years and this plant definitely exhibits variety hispidus characteristics. I get arguments from people because variety hispidus is supposed to grow in well drained uplands and my plants are growing near and in the creek. Swamp Buttercup, variety nitidus, is supposed to grow in wetland situations, so some people automatically assume that these are variety nitidus because they are growing in the water. I explain, sometimes to no avail, that in the upper reaches of a watershed in extremely well drained areas it’s possible for even the creek beds to behave in a manner consistent with well drained uplands. The creek is often dry most of the summer and the banks are certainly like well drained uplands. You expect a species that has recognizable varieties to demonstrate a range of traits outside the normal parameters. This plant has added an extra petal to the regular compliment of five. Another plant has gone to the extreme and doubled the number of petals to ten. I’ll bet a competent horticulturalist could take this plant and develop a line of fine bedding plants. Well, I guess before the public would really embrace this plant it would have to have more blooms and a more compact form. I personally find it quite showy. I just want to be sure I correctly identify it to everyone else. I just added species number 528 to my list of plants found growing at Blue Jay Barrens. 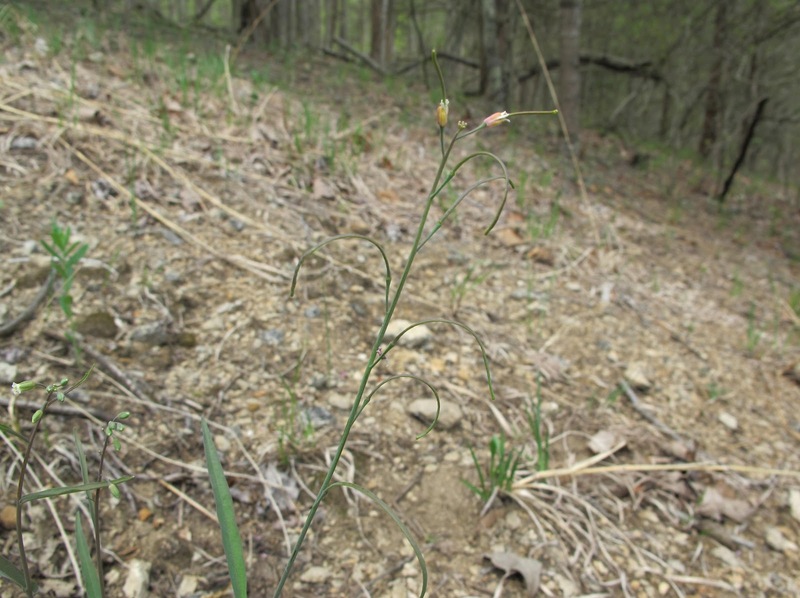 Smooth Rock Cress, Arabis laevigata, was found growing in the bare, rocky soil along the woodland edge. 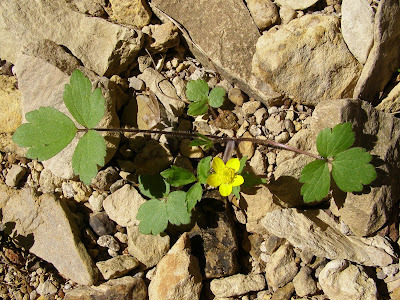 This member of the mustard family isn’t very showy, but it is a native. 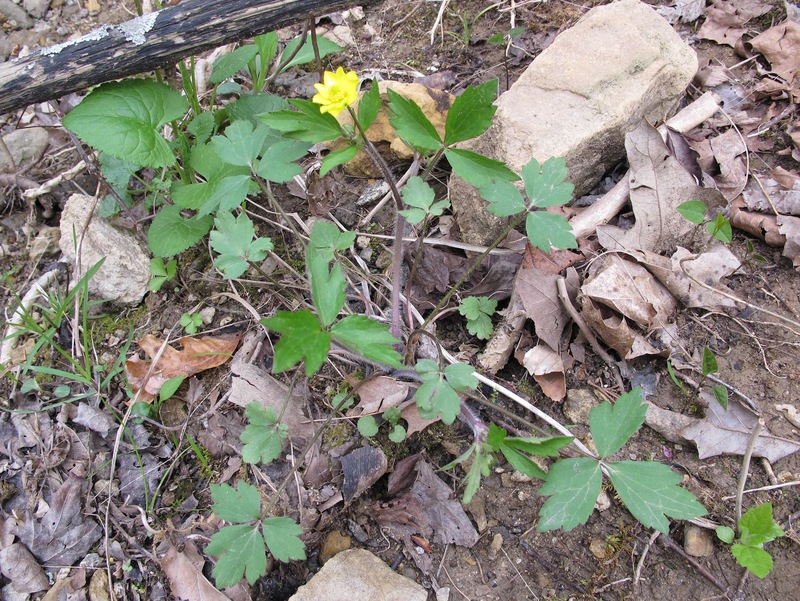 It’s always a treat to find a new plant growing here, especially a native. The plant was about 18 inches tall, but the thin stalk and few leaves made it hard to see. A careful search of the surrounding area revealed no more of these plants, so for now, this is the only individual know to be on the property. I’ll keep watching for more. It’s easy to see why the plant is referred to as smooth. Stalk and leaves are completely free of any hair or other irregularities. Projections at the base of the leaves reach out to hug the stalk. I’m always pleased when plants have features that can be detected without using any special instruments. There were three stalks growing on this plant. One was already producing several fruits. The long seed pods, known as siliques, arched out and then curled back toward the plant stalk. 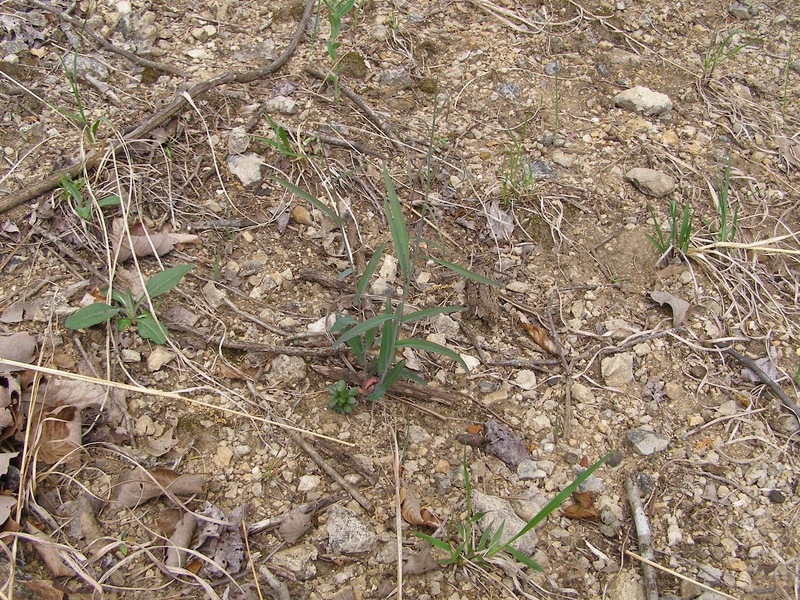 This shot gives a good idea of the steepness of the ground where the plant is growing. The camera was level. 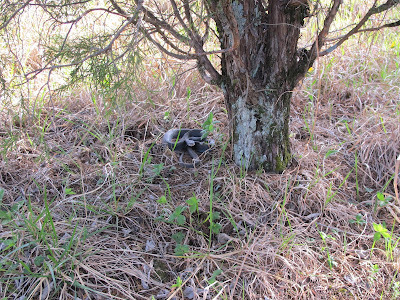 It’s the plant that was leaning, along with the ground. This is the part of the plant that confuses me. 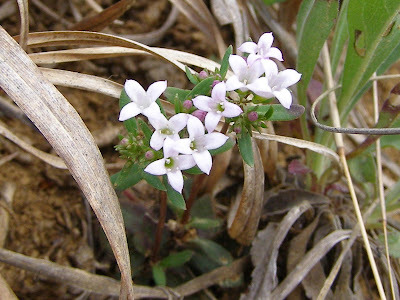 Smooth Rock Cress is supposed to be a biennial. 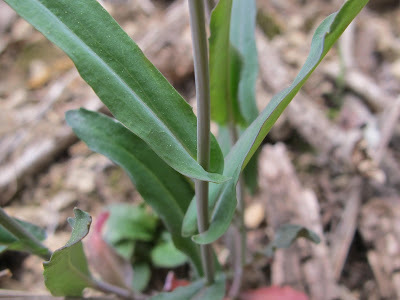 Basal leaves should grow the first year, followed by a flower stalk the second year. 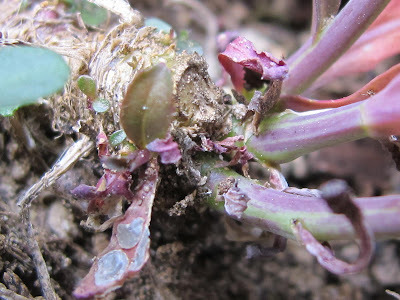 After flowering, the plant should die. 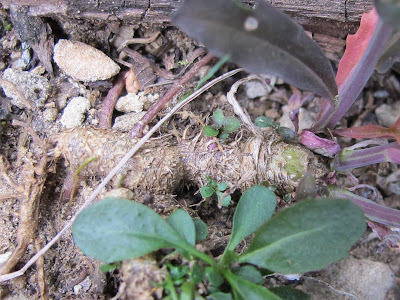 This plant seems to be growing from a rhizome that is also producing new clusters of basal leaves. 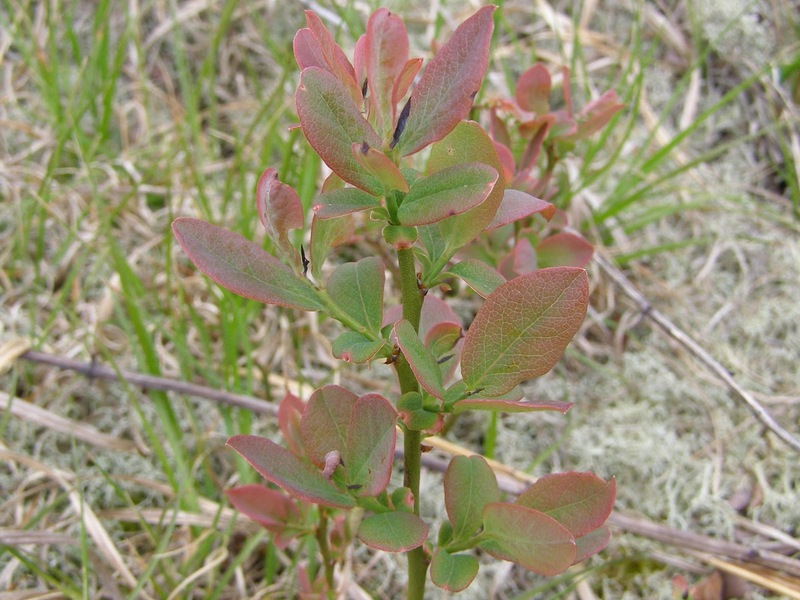 It seems logical to expect those clusters of basal leaves to produce flower stalks next year. 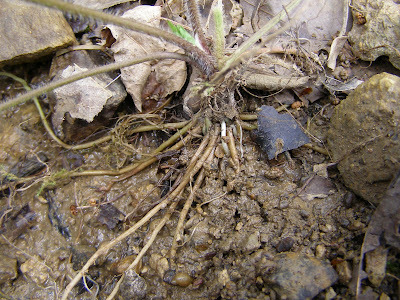 The flower stalks can die back each year, but the plant lives on as the overwintering rhizome. I’m thinking that the plant I’ve found is actually a perennial. I’ll have to add this plant to my watch list to see if it does come back next year with more flower stalks. I’m betting it will. Some Arabis species are described as being biennial or perennial. Descriptions of Smooth Winter Cress don’t mention the option of perenniality, but it might be possible. I was crossing one of the prairie openings yesterday evening when I heard the sound of a snake moving rapidly through the dried grass. I hurried ahead of the sound and intercepted this Black Racer as it entered a clearing beneath a large cedar. Note: Grace is scheduled to have her final cataract surgery today. I thought this would be a good subject to test her newly restored vision. 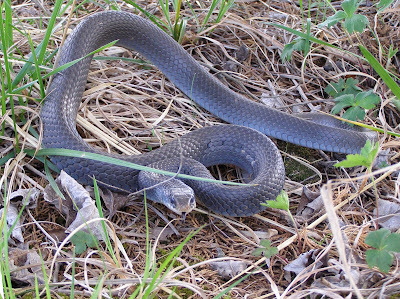 It stopped at my appearance and compressed its body laterally to form a ridge down its back. I assume this was to appear larger and less vulnerable to a potential threat. This is the first time I’ve had a racer behave in this manner. I wasn’t moving, so the snake began to coil its body. 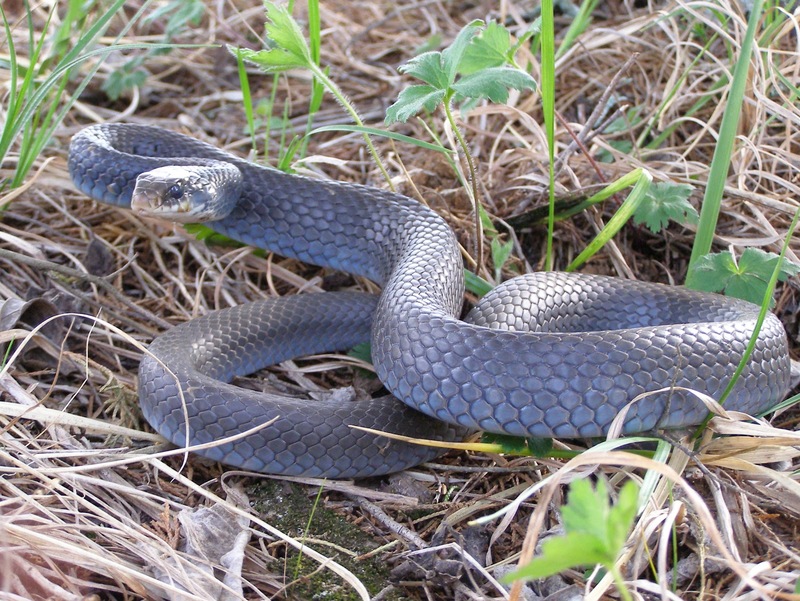 I call this a Black Racer because it’s the only racer we’re supposed to have in this area. 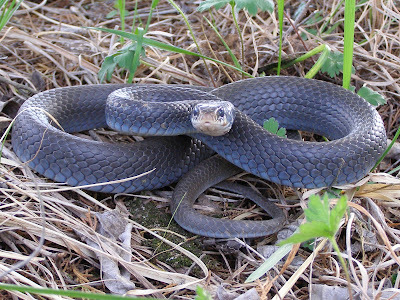 I have also read that the only difference between the black and blue subspecies is the color, so I’m not sure that this one shouldn’t be called a Blue Racer. 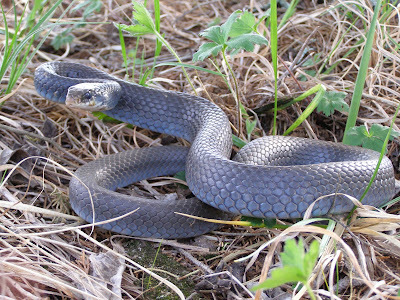 However it’s called, it was a beautiful specimen and quite willing to interact with me for a while. 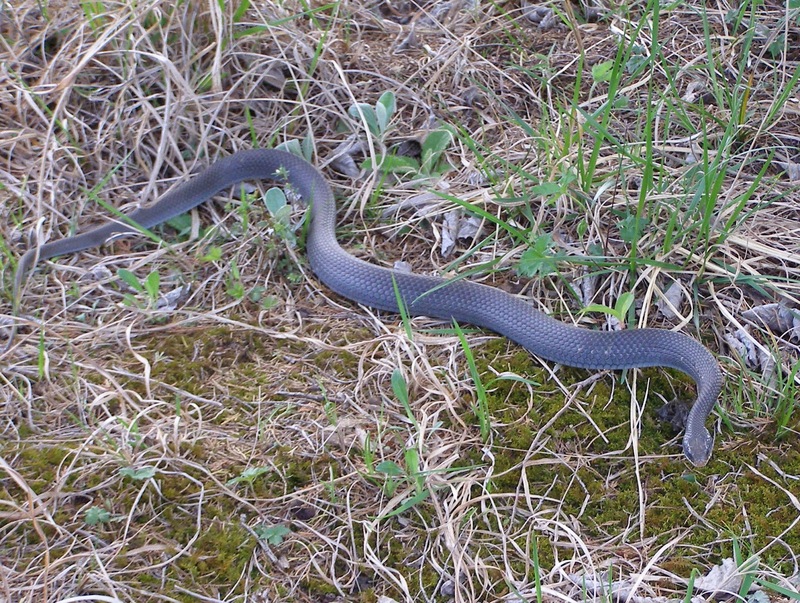 As it coiled its body, the snake kept its head directed straight at me. It whipped its tongue at me every time I moved, all the time tightening its coils. Once satisfactorily coiled, it settled in to stare. I thought at first that the blue coloration could just be the result of the snake preparing to shed. After watching for a while, I decided that the colors were just too bright and the eyes too clear for shedding to be imminent. 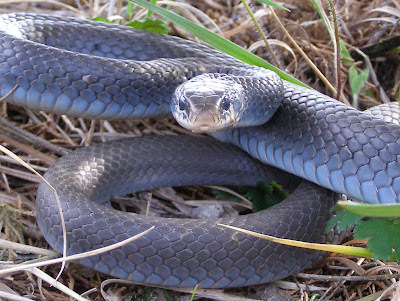 I think this is just the way the snake is colored. 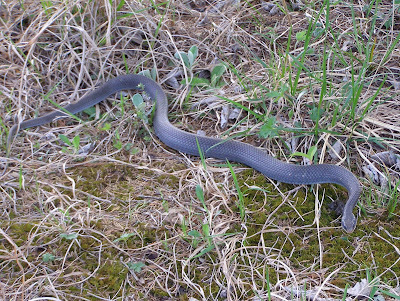 If I remained still for a while, the snake would begin to move off. If it saw me make any movement at all, it would pull itself back and continue the face off. 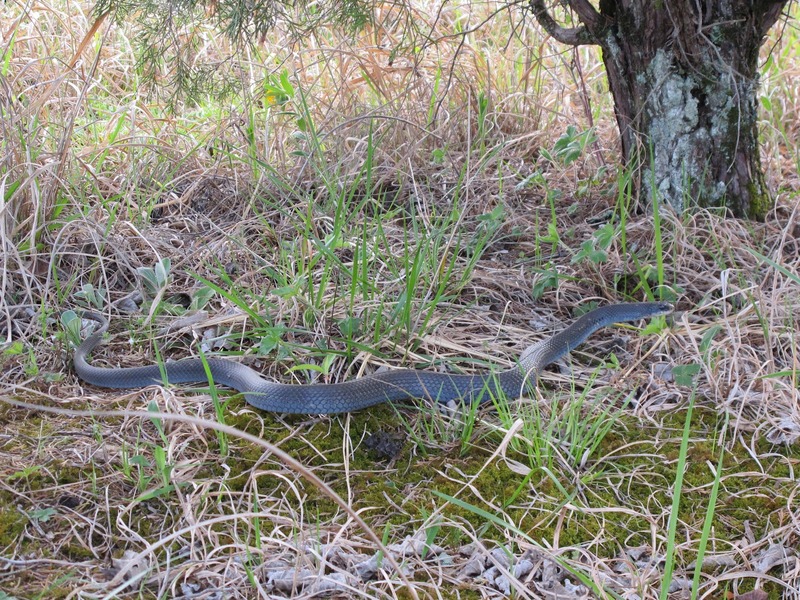 I moved my hand off to the side and the snake followed along. It wasn’t about to back down. The sunlight was rapidly disappearing, so I left the snake to continue whatever activity I had interrupted. 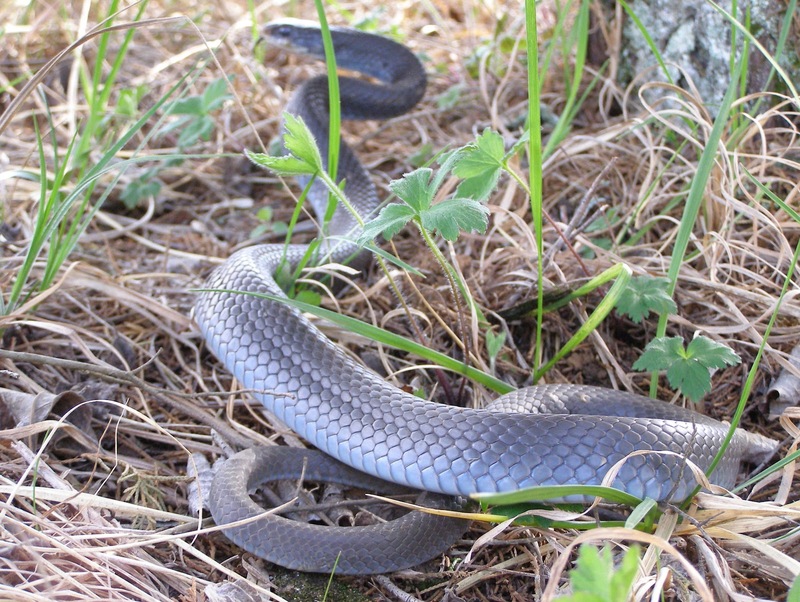 Things are looking good for this to be a very snaky summer. 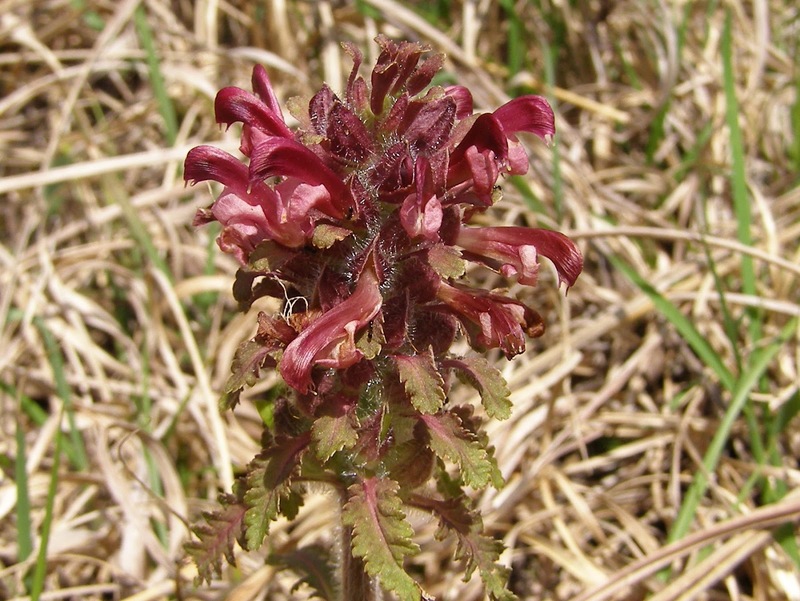 Spring time color appears more slowly on the prairies than it does in the woods. The first really noticeable display comes from the Hoary Puccoon. 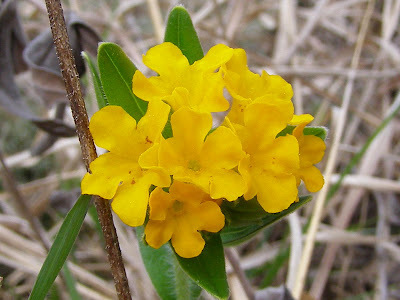 These bright yellow-orange flowers truly herald the beginning of the prairie flower show. 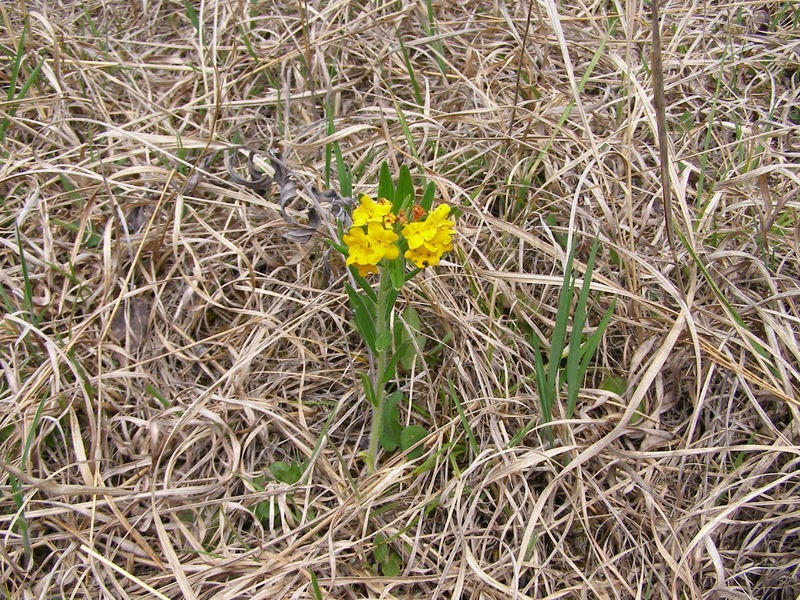 Hoary Puccoon is one species among many short statured prairie plants that must hurry its development early in the spring season in order to complete the flowering and pollination stage before becoming overgrown by the tall grasses. 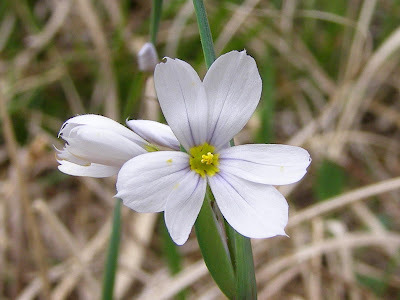 A seasonal favorite is the White Blue-eyed Grass. 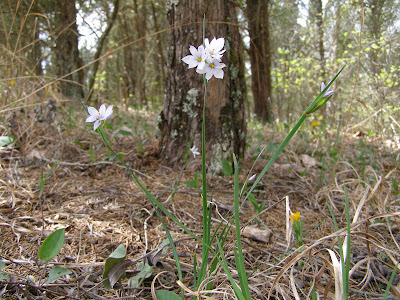 The bloom is small in size, but highly noticeable among the dead stalks of last year’s grasses. Flower color trends towards white, but some blue or purple markings are not uncommon and some blooms may exhibit a light blue shade. Even the bluest examples of White Blue-eyed Grass are far lighter than the other species. A close examination of the plant clearly shows the resemblance between these members of the Iris Family and their common flower bed relatives. The amazing thing is that the thin, flattened stems have the strength to remain upright. I always imagine that the first strong gust of wind will lay them all down. 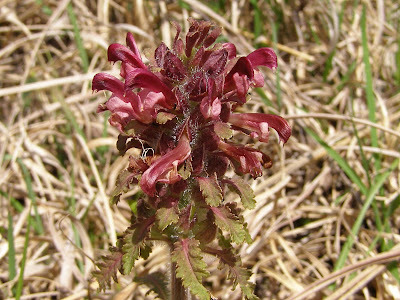 The first of the Wood Betony plants are just beginning to bloom. This plant is somewhat parasitic on other plants. 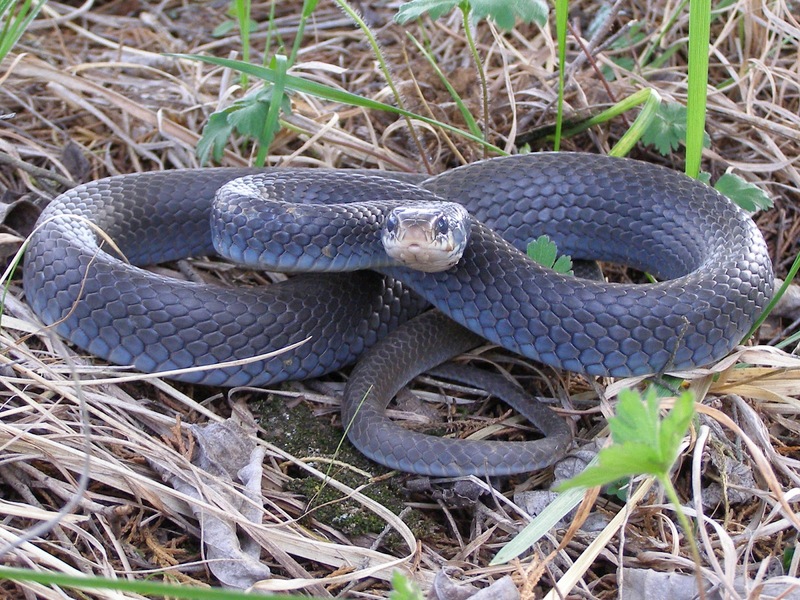 It is most common along the margins of prairie openings where it would have a chance at parasitizing tree roots. I don’t know the full list of possible host plants. 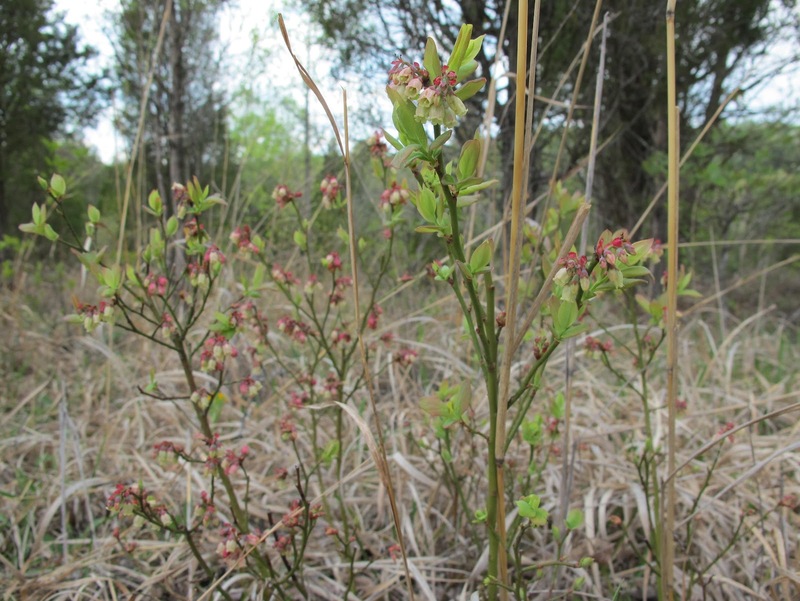 I’m assuming that its occurrence among a wide range of plant communities means that there are many possible hosts. One of the smallest of the current bloomers is the Fringed Houstonia. 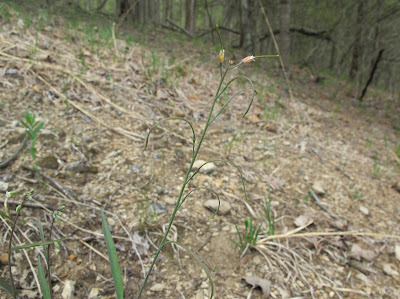 This plant attains a height of only a few inches and does that in the small openings between the tall grass plants. 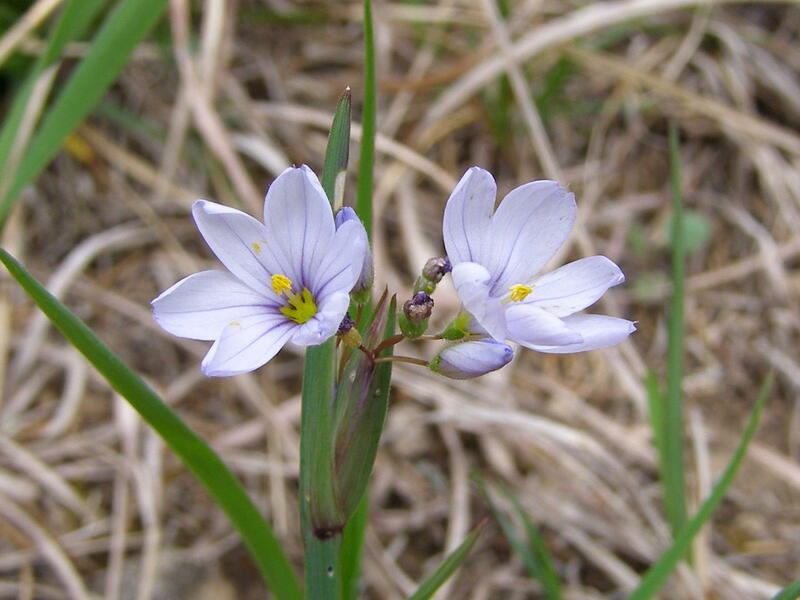 You might note a close family resemblance to the common Bluets. It’s bad enough that the plant is so small, but some of the key diagnostic features are almost impossible to see with the unaided eye. Tiny hairs around the margins of the basal leaves are this guy’s claim to fame. 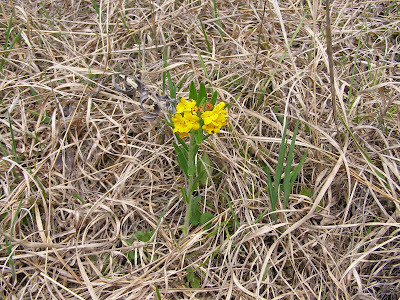 Early season prairie wildflowers are always numerous the year following a wet season. I’m expecting big things out of the prairies this year.